Summer and Bird is an exquisite book. 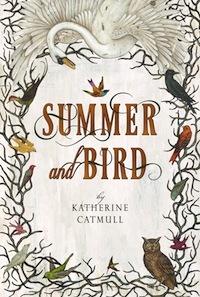 It’s not the kind of book I usually like – I’m a plot-driven reader who likes action and humor, and Summer and Bird is meandering, quiet, and sad, the story and even character second to the absolutely lovely prose. So the fact that I couldn’t put it down when it’s so unlike my usual tastes says quite a lot. To be honest, I’m not entirely sure how to talk about it, since it’s so not about the story that it’s hard to coherently say “and then this happens and this is how I felt about it.” It’s like reading a poem. The worldbuilding is wonderful, mingling Norse mythology, Western European folklore, and original concepts in a way that feels both timeless and original. The villain is terrifying and loathsome, but still somehow relatable. The main characters will break your heart – I was totally captivated by them, even if I wasn’t quite sure I liked most of them. It made me cry twice on the subway. And hey! All of the main characters are women! That’s pretty cool. I apologize for not having anything more helpful to say than “Summer and Bird is great, you should read it,” but…Summer and Bird is great. You should read it. Four and a half cupcakes. This entry was posted on Wednesday, February 13th, 2013 at 8:58 pm and is filed under 4.5 Cupcakes, Fairy Tale/Mythic, Portal Fantasy. You can follow any responses to this entry through the RSS 2.0 feed. You can leave a response, or trackback from your own site.